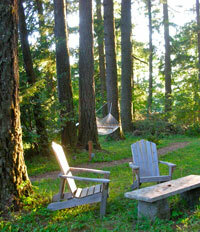 The tipis are furnished in a Zen style. 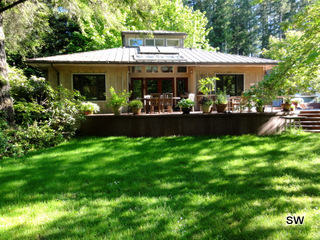 They have beautiful stone floors with rugs, warm and comfy beds with down comforters and wool blankets for the cool Oregon summer nights. For a more traditional sleeping experience, there are the cabins or the rooms. 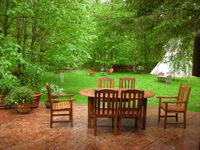 All tipis and cabins have access to a centrally located bath house with two full bathrooms. The Master Bedroom Suite and the Studio have their own private bathrooms. There is an additional bathroom available in the main house. 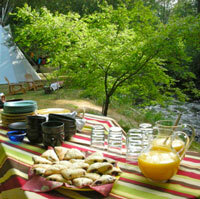 Breakfast is served either by the creek or on the patio. 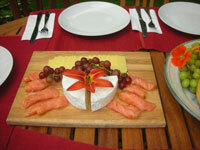 Your stay includes a wholesome gourmet breakfast of organic free-range eggs, smoked salmon, breads, hot cereals, fresh fruit, milk, yogurt, orange juice, coffee and tea. 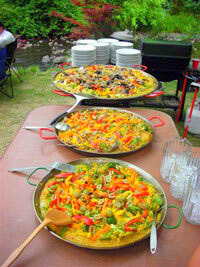 Ken also cooks up some amazing Spanish Paella feasts in the outdoor kitchen. Dinners are available by prior arrangement. We also offer Reflexology and Yoga sessions for guests, for details and pricing, check the Other Activities menu. Time takes on a different meaning out here. 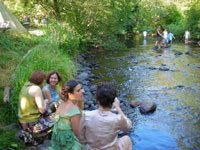 You feel yourself relax into a slower pace – into the here and now of birds singing and water flowing. - If you sit still, you can observe the wild flock of quail, the occasional pheasant or the wild turkeys and deer coming through on their daily routes. In the spring we see elk bulls grazing at the edge of the forest, and in the fall Oregon Chinook salmon swimming upstream in the creek. - If you sit still, you will experience nature’s silence and stillness. You will find an atmosphere of respect amongst these tall trees. Respect for the Land, the Keepers of the Land, all Living Creatures, and for Mother Nature. and the Great Spirit bless all who enter there.